There are different ways to express joy. One is the kind that bursts out like the sun appearing from behind a dark cloud. It’s gloriously, suddenly brilliant and you feel instantly warm and happy. That is the kind of joy that inspired this new Symbala. May it bring a sudden, yet lingering sense of happy well-being! The name of this Symbala, ‘Quantum Creating’, directly reflects my understanding of the process I use to draw the Symbalas. In this context, the meaning of ‘quantum’ is not from a physics perspective, but a metaphysics one. 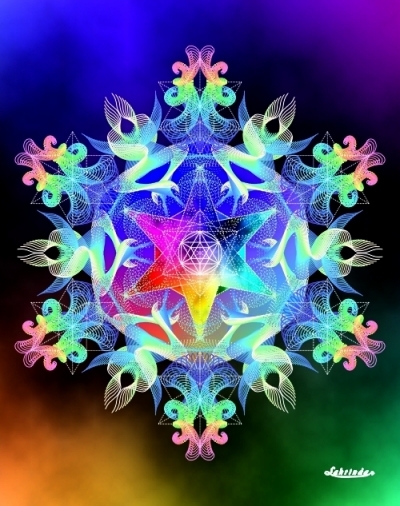 The quantum energy system I work with for Symbala creation is channeled from other dimensions and is both symbolic and geometric in nature. Featured Symbala of the Month, April 2019. Symbala of the Month Archive. 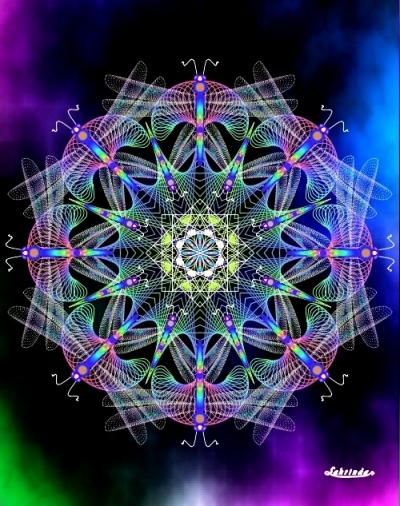 …Symbalas embody a rainbow/dragonfly spirit of movement and frequency which makes them very useful tools for working with the process of change, inner and outer. In the drawing I worked with the geometry of the 4 and 8 embedding the energy of dimensional shifting from form to matter. Please visit my Zazzle Store where you will find this Symbala inspiring many products like a greeting card, poster, magnet, keychains, medallion you can wear and a beautiful fleece blanket. My Personal Symbala has always been an intimate touchstone, gift to self and reflection of the evolutionary spiral of my spiritual journey. 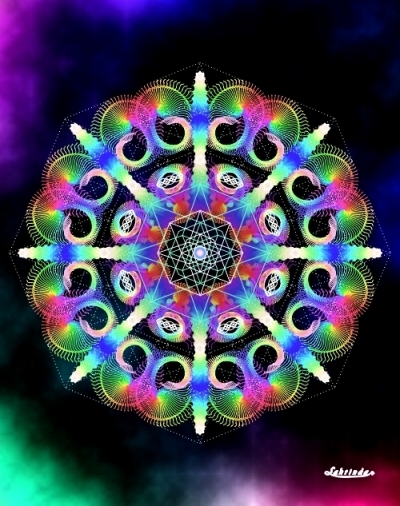 It is the mirror of my awakening as FORM FOLLOWS FREQUENCY. The first two months of this year convinced me it was time for a Personal Symbala Renewal. These months have been fragmenting and very challenging and drawing a Symbala is the best medicine I know. I encourage clients who have gotten a Personal Symbala to get a Renewal periodically, as we are changing so rapidly. So I was distinctly feeling the pull to renew, as I like to explore a new connection with changing self at least once or twice a year. My Renewal reflected the strength and clarity I had been lacking and pulled my spirits up immediately. Featured Symbala of the Month, March 2019. Welcome to the World of Symbalas! Symbalas provide poetry and music for the eyes and a feast for the soul. Each Symbala is a focal point which can uplift and bring balance. The senses are immersed and energy is renewed. The experience can bring insight, transformation and a more conscious, centered and creative life. 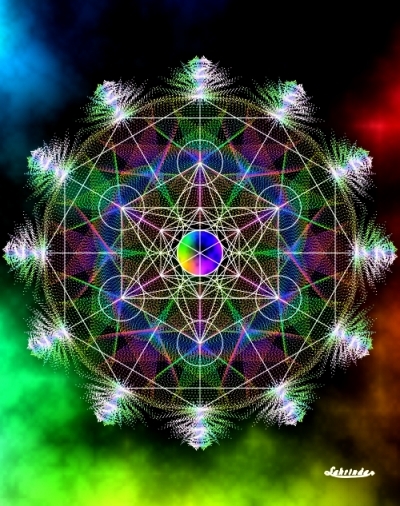 NEW FEATURE Introducing the Solfeggio Tones Meditation Gallery. Solfeggio Tones, a key to the Universe: you can use the tones and the 9 Symbalas I drew for them to find harmony, health and well-being. These 24 archival quality prints are 8.5 x 11" with a backing in a clear, poly sleeve. Low price makes them great for uplifting gifts or additions to your own attunement tool kit. Check back frequently to see changes and additions to this page. HOW DO YOU GET THERE? These 2 features are presented for the exclusive use of the people who receive my monthly newsletter; so the links will be sent to you when you sign-up for the Mailing List. A digital publishing site where I offer a large variety of Symbala products: from greeting cards to keychains! New to Symbala World: You can now find me on Facebook, which I finally joined. Also there is a way to speak to me for free on Skype, if you’re so inclined. If you don’t have Skype yet, here’s a link to sign up and join those of us who love the free calling and seeing (if you have a camera) friends and dear ones far away. I can now see my son and granddaughter regularly, even though they live thousands of miles away.